Easily schedule both sliders and individual slides to be displayed at specific time intervals. Perfect for highlighting time-sensitive content. Do you want to display specific slider or slides for a specific period of time? That’s where Soliloquy’s Schedule addon comes in handy. Now you can automatically schedule both sliders and individual slides to be displayed at specific time intervals. The interface for setting the time intervals is as easy as click a field and selecting your time specifications. This is perfect for highlighting time-sensitive items such as holiday sales, featured specials, and more. No need to wake up at odd hours to disable a slide. 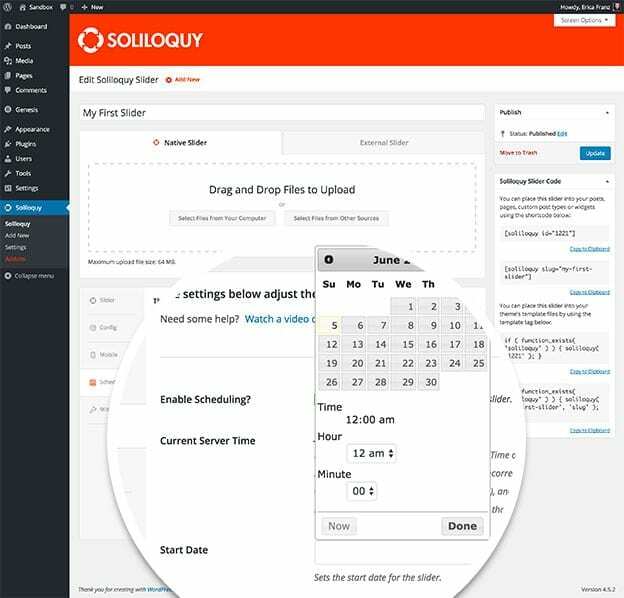 Use our schedule addon to automatically schedule slides and sliders in WordPress.